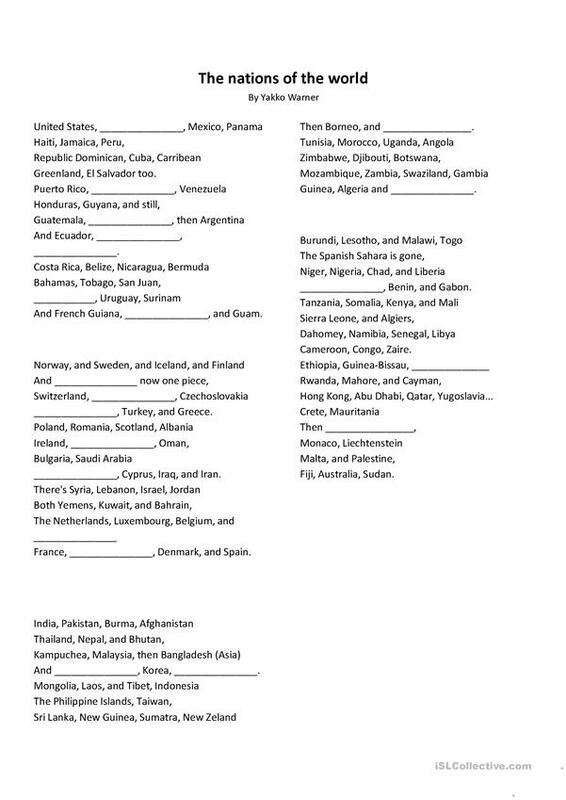 This is a fill-in-the-gaps activity where students can practise names of countries in Listening. The teacher still needs to get access to the song. TIP: www.youtube.com has got the video which points at each country as it's beign mentioned. The above downloadable printable is recommended for elementary school students and adults at Elementary (A1) and Pre-intermediate (A2) level. It is useful for working on your learners' Listening skills. It is focused on the theme of Countries. Stelle11 is from/lives in Mexico and has been a member of iSLCollective since 2013-01-21 01:30:13. Stelle11 last logged in on 2013-01-21 01:30:14, and has shared 1 resources on iSLCollective so far.